Don’t waste time standing around when you could be learning to Fight with Yiquan. Standing runs rampant in all the Internal Arts but none more so than Yiquan. 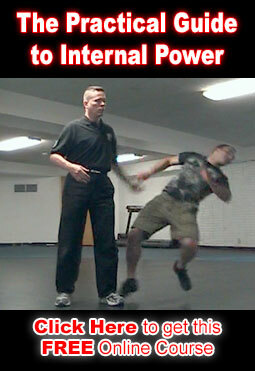 Unfortunately there are major pitfalls with standing practice that very few practitioners avoid. …and as a result they don’t learn the skills they’re looking for and instead build bad habits that have to then be unlearned before they can get to square one. …but first I want to cover two common mistakes folks make when trying to do standing practice. 1. Know Why & What You’re Doing! People often approach standing with vague ideas about what they’re working or gaining from the practice. Each time you stand you should be working on a very specific skill or skillset and have very specific goals in mind. for example, if you’ve chosen to work on root during your next session then you should pick a specific quality of root you wish to improve upon. For example: depth of your root. Then, don’t just try to get deeper. Be specific. If the deepest you can root is 20 feet (the minimum for first level push hands certification) then try to push it to 25. 2. Don’t stand too long! You’re trying to transform your body (or mind.) This does not come easily. It takes hard work over time. Just like strengthening the body through weight training, if you can do a high number of reps you’re probably not using enough weight to be effective. If you are working correctly then it should be very difficult to stand for more than 15 minutes, If you can stand for more than 15 minutes then, most likely, you are NOT practicing correctly or working hard enough. Standing practice can only produce the benefit it’s supposed to when paired with an understanding of the fighting application and internal principles of the art. Though it’s important to understand the traditional public teachings, function must always come before form. Stay tuned for more on our Yiquan course. Coming January 20th.